Savannas constitute one of the largest biomes of the world, covering about 20% of the land surface. Most of the world's savannas occur in Africa, with smaller areas in South America, India and Australia.1 In South Africa, savannas make up 35% of the land area, and are the basis of two major industries: cattle ranching and wildlife-related tourism.2 Savannas have existed in Africa for at least 30 million years, and their distribution and structure is determined largely by water availability, nutrient availability, herbivory and fire. Dry and warm winters, experienced over most of South Africa, combined with abundant grass fuels and ready sources of ignition (both lightning and humans) ensure that fires are a regular feature of savanna landscapes. Approaches to the management of protected areas evolved as ecological understanding grew in the 20th century. Management was initially influenced by research carried out for agricultural purposes, but in the second half of the 20th century, research carried out in protected areas became more important. Changes in ecological thinking also had a significant influence. These included a move from management promoting a desired stable state to one that embraced flux over time and heterogeneity in space, and an expansion of the goals of conservation to include all elements of biodiversity. This paper traces the evolution of fire management policies in savanna vegetation during the 20th century. This paper does not provide a detailed account of savanna fire ecology, as good reviews exist elsewhere.2,3 Rather, I have attempted to explore the development of ecologically-based management approaches, with a focus on savanna protected areas in southern Africa. Savannas are characterised by the coexistence of two major life forms: grasses and trees. The mechanisms that allow grasses and trees to coexist are central to the understanding of savanna ecology. This coexistence is traditionally explained by either equilibrium or disequilibrium models.4 Equilibrium models propose that grasstree coexistence is possible, for example, because of separation of the rooting niche, with trees having sole access to water in deeper soil horizons and grasses having preferential access to, and being superior competitors for, water in the surface soil horizons.5 In this equilibrium model, climatic variability precludes dominance by either life form, and coexistence is possible in a variety of states.6 Disequilibrium models, on the other hand, propose that there is no stable equilibrium, and that frequent disturbances prevent the extinction through competition of either grasses or trees by periodically biasing conditions in favour of alternative competitors. A disequilibrium model has been proposed in which interactions between life history characteristics of trees (sprouting ability, fire survival at different life stages and mortality) and the occurrence of fires (which prevent recruitment of trees into adult life classes) could explain coexistence.7 This model identified the critical need for variability in fire intensity as a prerequisite for grasstree coexistence, and suggested that the imposition of fire regimes of homogenous intensity (such as those associated with regular prescribed burning) could lead to dominance by grasses. Although fire is a vital ecosystem process in savannas, there was practically no research on its effects until the 1950s.9 Fire research began in the Kruger National Park with the establishment in 1954 of an experiment to test the effects of fire on the vegetation.10,11 This was followed in 1974 with the establishment of the Nylsvley research site as part of the Savanna Biome Project.12,13 In the early 1970s, Winston Trollope established an experiment to examine the effects of fire and herbivory in the Eastern Cape Province.12 In addition, the possibility of expanding research to the then Hluhluwe and Umfolozi Game Reserves in northern KwaZulu-Natal also was proposed in 1978,12 but not implemented. Only 24 accounts of South African savanna fire ecology were published between 1950 and 1978, and most addressed the issue of bush encroachment.9 The advent of the Scientific Committee on Problems of the Environment (SCOPE) project in 1978 on the ecological effects of fire resulted in the production of a synthesis volume that sought to establish ecological principles regarding the role of fire in ecosystems.14 Fire research in savannas also received a boost with the international Southern African Fire-Atmosphere Research Initiative (SAFARI)15,16 in 1992. This work addressed questions relating to the role of fire in affecting the chemistry of the atmosphere. Although SAFARI had macroscale aims from which savanna managers were not expected to benefit directly, it brought home the realities of potential deposition of industrial and motor vehicle emissions and possible nitrogen leaks from upstream areas.11 The SCOPE and SAFARI initiatives were interdisciplinary, and provided a solid understanding basis on which savanna managers could build. From the 1980s onwards, managers of savanna protected areas, armed with understanding generated by the SCOPE (and later SAFARI) research initiatives, experimented on large scales with different approaches. All of these approaches were based on the belief that fires were both inevitable and necessary, and that they could be used to achieve ecological goals (Table 1). Several examples merit consideration here. In the Pilanesberg National Park, a patch-mosaic burning system was developed to create a diverse fire regime.34 In this system, the area burnt per year is a function of the grass fuel load, and the number of fires per year is a function of the percentage area burnt. Fires are point-ignited, under a range of fuel and weather conditions, and allowed to burn out by themselves. The seasonal distribution of planned fires over a year is dependent on the number of fires. Early dry season fires (MayJune) tend to be small because fuels have not yet fully cured, while late season fires (AugustNovember) are larger. More fires are ignited in the early dry season, with fewer in the late dry season. The seasonality, area burnt, and fire intensity are spatially and temporally varied across a landscape. The aim of this approach is to impose a variable fire regime on the landscape, on the assumption that this promotes heterogeneity and the conservation of biodiversity. Arguably the largest changes in fire management approaches in savanna ecosystems came about as a result of changing paradigms in both conservation and ecology.25,35 For over a century, the primary conservation goal in savanna ecosystems was the protection of large mammals. The commonly-used name 'game reserve' betrays the intention to conserve animals (game) for hunting (and later tourism) purposes. A global trend towards the conservation of biodiversity (rather than particular, often charismatic, species) led to these goals being challenged, and in many places they were replaced by goals that required the conservation of all facets of biodiversity. Changes in ecological thinking also came about with the growing realisation that ecosystems were far from stable, and management aimed at the maintenance of a particular state was doomed to failure. The adoption of a heterogeneity paradigm in savanna ecology, with variability as a central concept,24,25,36 has required thinking about the use of fire in ways quite different to the fixed-area, fixed-return interval approach that characterised the 1950s to 1980s, which aimed at maintaining a stable vegetation structure. Currently, most burning programmes in savanna protected areas encourage variability in space and time, and seek to mimic 'natural' conditions. 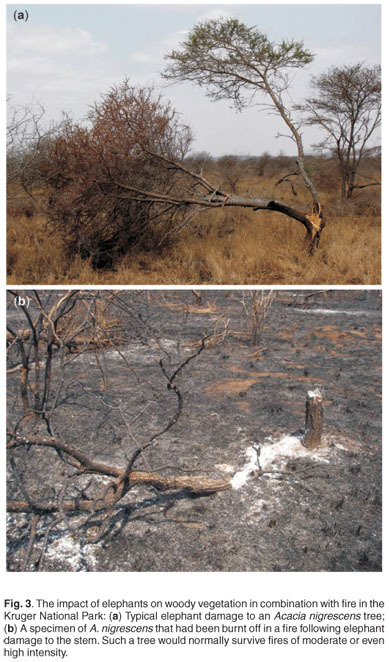 The difficulties facing mid-and late-20th century ecosystem managers who sought to impose a fire regime of their choice on savanna ecosystems are reflected by the experience in the Kruger National Park. Despite adopting different approaches to the use of fire (described above), the total area burnt was found to be predominantly determined by grass fuel loads, in turn determined by rainfall over the previous two years, and was unaffected by the management approach (Fig. 1).37 Further evidence regarding the difficulty of applying desired fire regimes came from experimental burning plots. The attempt to impose a series of fire regimes (annual, biennial and triennial fires, and protection from fire) on small (7 ha) plots was also not entirely successful. The degree of success was higher in areas of higher (and thus more reliable) rainfall, but, even in these cases, there were some years in which fires were not possible. In addition, some of the plots intended as controls (protection from fire) were burnt in accidental fires (Fig. 2). Given that it was not possible to impose a fire regime consistently on small plots, even with large budgets to support attempts to do so, it follows that imposition of fire regimes onto very large areas would be much less likely to succeed. In the Kruger National Park, the concept of adaptive management using 'thresholds of potential concern' was introduced in the mid-1990s.38 Under this framework, upper and lower thresholds were defined for a range of ecosystem indicators. If a threshold is reached, then management interventions are considered; alternatively, the threshold could be recalibrated. In line with this policy, a range of thresholds relating to fire patterns was proposed.39 The framework included thresholds relating to fire-return periods, the seasonal distribution of fires, the range of desired fire intensities, the size-class distribution of fires and the cause of fires (whether they were 'natural' lightning fires, or fires initiated by humans). Deviations from these thresholds were intended to alert managers to the possibility that fires were either too frequent, too infrequent, or otherwise deviating from acceptable limits in the area concerned. When management by 'thresholds of potential concern' was introduced to replace prescribed block burning, the goal was to encourage a 'natural' (lightning-driven) fire regime in the park. After a decade, however, it became apparent that this would not be possible, as fires ignited by people dominated the fire regime.11 This led to the introduction of the park's current fire management objectives, which reflect the ongoing need for better understanding of the ecological role of fire. This need remains despite considerable research into the ecological role of fire in the park.11 Besides safety considerations, the specific ecological objectives within the park are to understand the role of fire as a natural process, and its relationship with other interacting co-drivers, so as to develop an informed context for management.29 The sub-objectives include the need to fill important knowledge gaps with respect to the effects of fire on elements of biodiversity, as well as the use of new understanding to recommend feasible fire-management policies and procedures. Many lessons have been learned about fire management in savannas, arising both from research as well as the application of fire in different ways and in different areas. As a result, a number of principles can be recognised. Fire is a vital ecological process in maintaining the structure of savannas in relatively moist areas. In moist savannas (where mean annual rainfall >650 mm), the tree layer is not constrained by a lack of moisture, but is prevented from reaching closure because of repeated fires and pressure from herbivores. In such areas, the elimination of fire will result in dominance by woody vegetation. The incidence of fires in these ecosystems is also more regular, as less variable rainfall results in the more regular accumulation of sufficient fuel to support a spreading fire. Fire is a less dominant ecological process in relatively arid areas. In arid savannas (where mean annual rainfall <650 mm), the tree layer is effectively prevented from reaching closure, as it is constrained by a lack of moisture. In these systems, the elimination of fire will not lead to total dominance by woody vegetation. The incidence of fires in these ecosystems is also more erratic, as variable rainfall and herbivory often prevent the accumulation of sufficient fuel to support regular spreading fires. Fires do not act alone in shaping the vegetation. The regular removal of grass by a variety of grazing species affects fuel loads,35 and thus the occurrence and intensity of fires. Damage to woody plants by a range of animals (such as porcupines40 and elephants29) affects their post-fire survival, their ability to compete with grasses, and thus their abundance and relative dominance in the vegetation. The ability of managers to control fire regimes over large areas is often limited, especially in more arid areas. Fuel loads respond to variations in rainfall more than to post-fire age, and many uncontrollable sources of ignition combine with the regular occurrence of weather suitable for fires to ignite grass fuels. The belief that diverse fire regimes are necessary for conservation remains unproven. In a recent critique of the 'patch burning' approach,41 it was pointed out that the relationship between pyrodiversity and biodiversity, if any, is at best poorly understood; that in robust and resilient ecosystems (such as African savannas), a wide range of fire regimes have little effect on the ecosystem anyway; and that the dogma of 'pyrodiversity begets biodiversity' is often accepted unquestioningly by managers. All of these are valid criticisms. As was pointed out in the original paper that proposed the thresholds for the Kruger National Park,39 there is a need for ecological studies to assess the impacts of fire regimes, and the validity of thresholds. The management of fire in savannas will become more complex in future. Changes in global climate will have both direct and indirect impacts on fires and their effects; increases in CO2 concentrations in the atmosphere will affect the balance between grasses and trees; invasion by alien plants may also have significant impacts; and growing human populations will result in ever-increasing sources of ignition. Some of these issues are addressed in the next section. The key to a better understanding of fire ecology and the development of effective management interventions appears to lie in the adoption of a system of adaptive management.42 Any fire management system should incorporate an effective feedback process involving systematic monitoring, based on timely and accurate mapping of burned areas, combined with monitoring both of fire heterogeneity and effects on biota.41 While modern geographical information systems can assist greatly in the analysis of fire patterns, the two weak links at present are obtaining and curating accurate fire maps, and establishing effective monitoring of biotic responses. In the first case, obtaining accurate fire maps will depend on the diligence and cooperation of 'on-the-ground' managers, which varies both within and between protected areas. The second lies in the challenge of identifying appropriate indicator elements to monitor, and maintaining accurate records over time and under scenarios of limited funding. As stated elsewhere,35 fire management in South African savanna protected areas is in a state of flux. This has followed two key changes in thinking over the past two decades. The first relates to the move away from the conservation of large and charismatic fauna, to the conservation of all biodiversity and landscapes. In fire management terms, this requires managers not only to think of what is good for animals, or the conservation of rangelands that support them, but also to consider all other life forms. This has led to the embracing of concepts of variability, and 'natural' fire regimes. The second relates to the replacement of concepts of ecosystem stability, and succession towards climax, with concepts of heterogeneity and flux across space and time, within a system best explained by disequilibrium models. This too has led to the promotion of management that seeks to establish variable fire regimes over space and time. Much remains to be done before these new concepts can become an integral part of routine savanna management. Currently, managers have been adoptingtheparadigmof 'pyrodiversitybegetsbiodiversity'too easily,41 and without clear guidelines on the ranges of diversity that are possible, that are needed, or that may be detrimental. The challenge here will be to understand the limits within which fire regimes can be managed, and more importantly to what the ecological effects of this variation will be. Two other concerns that will affect the management of fire in savanna ecosystems are currently being vigorously debated. The first relates to CO2 enrichment, and its effects on the balance between grass and trees in savannas. The phenomenon of 'bush encroachment' (increases in woody vegetation at the expense of grasses) has long been recognised as a major problem in South Africa.44 It is usually attributed to the elimination of the indigenous browsing fauna (including elephants), and overgrazing by cattle. Both would have given woody plants a competitive advantage over grassesthe first directly, and the second indirectly, as lower grass fuel loads associated with overgrazing would have led to less intense fires. Recent research has also suggested that low levels of atmospheric CO2 would have been a significant factor in the reduction of trees during glacial times, both because they would have experienced slower growth (and thus been more susceptible to fires), and because, under these conditions, fire would have promoted the spread of competing grasses.45 Rising CO2 levels (from 270 ppm in pre-industrial times to 370 ppm, and increasing, in modern times) could possibly explain the recent bush encroachment in savanna protected areas, despite the presence of large mammalian browsers. Attempts to recreate 'natural' fire regimes that simulate pre-colonisation fire regimes may be inappropriate under scenarios of global change and higher CO2 levels.35 The reversal of woody plant encroachment, and accompanying losses of biodiversity, will require the application of high-intensity, and possibly dangerous, fires to control woody plant growth. This is likely to present significant challenges to managers of savanna ecosystems. The second issue relates to the interactions between elephants and fire. Concern is often expressed about declining numbers of large trees in the Kruger National Park, which are at least in part due to fire, and interactions between fire and damage by elephants.46,47 The exclusion of one of either fire or elephants, and the presence of the other, both result in the dominance of large trees; the co-occurrence of both apparently erodes the number of large trees.27 Elephants do considerable damage to woody vegetation, and increase the susceptibility of trees to damage during fires (Fig. 3). It is therefore tempting to consider either the manipulation of fire regimes, or reductions in elephant numbers, as possible means of slowing or preventing declines in large trees in the presence of elephants. However, there are a number of underlying principles that need to be considered before such interventions can be proposed.48 These include: (i) the absence of a benchmark against which to judge an 'ideal' vegetation state for the park; (ii) the possibility that large trees present today may have established during a time when elephants had been eliminated from the area, as has happened elsewhere49 and which is itself an unnatural situation; and (iii) the fact that observed declines in large trees took place despite limiting the elephant population through culling for over three decades. Manipulation of one component of an ecosystem is likely to be ineffective because poorly understood feedbacks are not taken into account and 'perpetual tinkering' to meet aesthetic objectives should be avoided.48 There is also growing recognition that ecosystems are in a state of flux36 and that stable or semi-stable states are both unattainable and undesirable. Thresholds for the maintenance of tree populations need to be made spatially explicit, for example so that the elimination of large trees can be tolerated in some areas as long as they survive in others.48 Clearly, the issue of interactions between fire regimes, herbivory and other factors requires better understanding if concrete recommendations about the use of fire are to be made. The evolution of fire management in southern Africa over the past century has reflected increasing levels of ecological understanding. Attitudes towards fire and its management have changed dramatically from the views of the 1920s, when fire was regarded, in an ecological sense, as a detrimental force that needed to be controlled. These views were slow to change, but over the next few decades fire came to be viewed by many as something that was not always bad, and had to be tolerated and understood. As a result, many critically important long-term burning experiments were initiated in the 1950s and 1960s. As ecological understanding advanced further, fire was finally recognised as a key ecosystem process that was both inevitable and necessary. The evolution of fire management approaches and philosophies reflected this advance in understanding. During the early 20th century, fire prevention and suppression was the order of the day. With the later acceptance of prescribed burning as a management practice, policies were developed with a view to imposing a desired fire regime onto the landscape. Under these policies, managers focussed on the implementation of particular prescriptions, without critically assessing whether or not strategic ecological objectives were met. More recently, in South Africa and elsewhere, there has been much progress towards attempts to influence fire regimes, rather than to maintain a 'command-and-control' approach.50 While we are beginning to understand the degree to which fire regimes can be influenced, surprisingly little is known about the ultimate ecological outcomes of altered fire regimes. There is thus an ongoing emphasis on setting management goals (both in terms of fire regimes and their outcomes), monitoring the outcomes closely, and making adjustments as understanding increases. Our ability to deal with dynamic ecosystem management challenges within the context of imperfect understanding will be determined by how well, and how fast, we can learn from experience. The recent adoption of adaptive management approaches is certainly a step in the right direction, but it needs to be expanded and strengthened. Adaptive management will require managers to set measurable (and meaningful) goals, collect and curate considerable volumes of data, and to continually assess new evidence, and change approaches, as understanding increases. In South Africa, we are fortunate to have a strong tradition of ecological research, and consequently understanding, on which to build. This tradition must be passed on to young South Africans if science is to maintain its important role in informing management and conservation. I thank Harry Biggs for stimulating discussions on adaptive management. Figures 1 and 2 are reproduced, with permission, from the journals Conservation Biology and International Journal of Wildland Fire, respectively. Received 6 April. Accepted 7 September 2009.